I had the privilege of going to the Park World Tour events in Beijing in 2010, and the big question in my head wasn't if I would go again, but when I would go again. Fortunately, that time was September 12-23, 2012! After a short 19 hours of travelling and the mysterious disappearance of Wednesday, I arrived in our first destination on this three city tour, Changchun. This was a pretty small city, with a scant 7.6 million residents. Its a relative small. The races here were in conjunction with the Vasa China Orienteering festival. If you weren't aware, there is a pretty impressive Vasaloppet China ski event that has been happening for quite some years now, and these events are the orienteering side of the company that puts on these Scandinavian-inspired events. In the Jing Yuetan Forest Park, we did a sprint and middle distance. The sprint was your standard park sprint. Yet, it wasn't. Because its in China. You take your standard pedestrian bridge in Canada, for instance, and turn it into an arched log bridge with a decorative canopy on it. Its the little touches that turns 'average' park into a 'unique' place to race. The middle distance, however, was decidedly forested. A tad on the green side in places, it started at the equally impressive Vasa house, which included a German restaurant, and an elaborate Vasa China museum, which certainly suggests the events are doing pretty well for themselves. The forest around this area was generally green, with a network of trails. There was some sort of mysterious stinging flora out there, too, as everyone came back with, not quite an itch, not quite a rash, but some mysterious feeling on their skin (most notably their arms), which seemed to have a burning sensation on contact for quite a few days. That part was slightly less than ideal. However, when it wasn't green and scratchy, the white forest was impressively open and fast. Anyone who says that China doesn't have good terrain really doesn't know what they are talking about. I lament the disappearance of the Asian Pacific Championships; I think many Canadians are missing out on some amazing opportunities to venture out and see this wilderness. Not bad at all, if I do say so myself. If you haven't seen my DOMA which has my GPS route for both of these races in Changchun, you can see it at OC Doma . At this point you will also appreciate why I'm not really discussing my personal performance from these races. Once these two races were over, we hopped on a bus, and a train, and then a plane, and found ourselves in the town of Wansheng, just outside the Mega-mega-city of Chonqing, with a population of 28 million. Seeing this place at night was amazing. Wansheng was comparatively sleepy, probably the biggest upside was the absence of constant car horns blasting all day and all night long. The reason for going to Wansheng was that we were now at the Chinese National Championships, and the "2012 Orienteering World Ranking Event". This event also took on a variety of other wacky English translation names along the way. I seem to recall one of them was "2012 Qualifying Championship World Event". Good stuff. The two races we did here, a sprint and a middle, were unquestionably the two most unique races I have ever done. Words can't quite do justice to what the terrain was like for the sprint. It was a residential area, but a Chinese one. The passageways were incredibly narrow, and it felt like you were running through people's living rooms. It was extremely difficult to keep track of where you were, and you would look into the passage way you're planning on taking, and just say "That can't POSSIBLY be it, that's someones house!" But, it really was. To add to the adventure, it also started raining just as I started, making the entire course a slippery death trap as well. Several guys slipped and fell down stairs, walls, etc. Super sketchy, just to add to the craziness. I didn't end up having time to go back there with a head camera, however here is a brief video from Miguel Silva that gives a pretty good idea of what it was like. Amazing. The middle the next day was equally wacky, in a completely different way. The terrain was a mixture of small tufts of forest on roundish spurs and hillsides, combined with plenty of cultivated land. The instructions we were provided ahead of time regarding the cultivated land was that the paths along the edges of each terrace or portion of farmland was okay to cross, and fields where the crops were already harvest were okay, but un-harvested farmland was not. Not being a farmer, I was quite certain I would have no idea how to tell the difference. Can you? The final race found us back in Beijing, in the Botanical Gardens. A relatively straight forward race, this one came down to making good decisions and running really fast, neither of which is necessarily my forte. Although I didn't necessarily improve my standard ranking, I was certainly more in the mix than in some of the other more debacle'd races. As Jaroslav, the organizer extraordinaire of this trip said, the great thing about these Park World Tour trips is that the athletes involved exist on the same level throughout all the competitions. Throughout all the travelling, bus trips, varying hotels, its not like the Norwegians are up in first class, or the French have their own fancypants accommodation. Even us lowly Canadians share the same space and eat the same food and travel the same way as everyone us. Were it not for trips like these, I'm not sure I'd ever have the courage to even make eye contact with World Champions, or share photos with a 2:18 marathoner (although I still don't make eye contact with most of the ladies, mostly out of fear). As long as can maintain a vague sense of competitive legitimacy, I will keep going on these trips for as long as possible. On this trip, I met a new swath of amazing people, and saw what I would consider the "real" China. When can I go again? After a summer of orienteering fun, I’m now getting settled back into university life in Squamish. 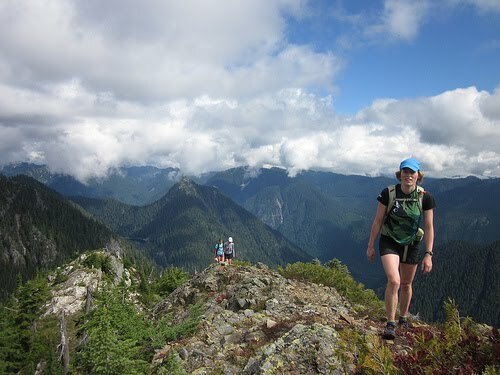 While there is an active orienteering club in Vancouver and a newly developed club in Whistler, there aren’t many orienteering events or trainings within Squamish itself. I have to transition into physical training by myself again. One fun orienteering related activity in Squamish is the Stawamus Chief. It is the second largest granite monolith in the world, standing at approximately 700m. 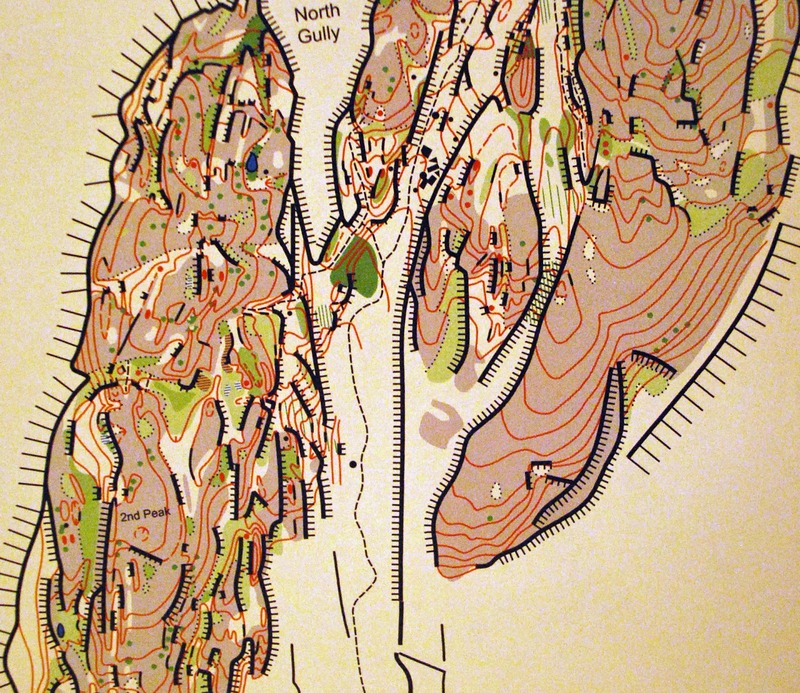 It’s a mecca for rock climbing, but it also has an orienteering map on top! The hike up is a training in itself (it took me around 45 minutes) and the views from the top are spectacular. Some sections are quite steep! At the top with my Chief hiking buddy. The orienteering is unique. There is lots of rock to say the least and some fun contour detail! 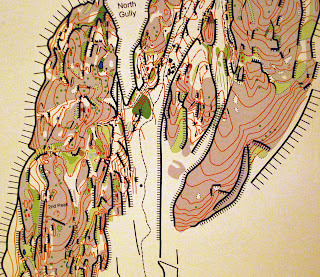 Section of the Chief orienteering map. It’s important to try to keep training fun, even when you can’t regularly get out to orienteering events. 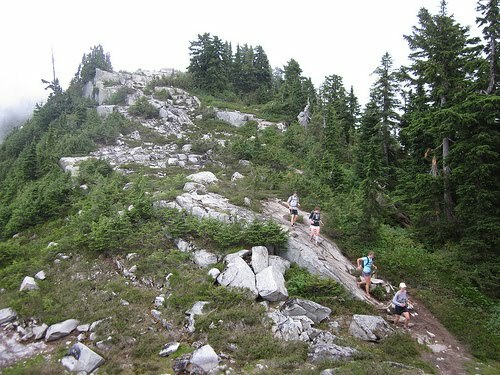 I hope to see some of you at the BC Orienteering Championships in Whistler this coming weekend. To the rest of you, happy training! I was a bit at a loss of what to put up for a blog post, so thought I would try for something a bit less on specific to orienteering and more to do with training and life in general. 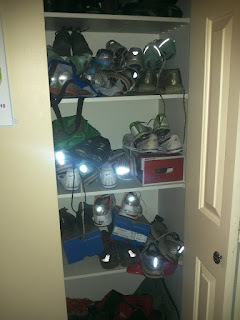 Some friends were over the other day to go for a run (a good percentage of our socializing centers around running and eating), and noticed the cupboard near our bathroom and started laughing. This cupboard is pictured below... and contains almost exclusively shoes (most of which are running shoes, of varying types and ages). In fact, my 2 pairs of icebug orienteering spikes are not even in this cupboard as I have another box in yet another cupboard with those for some reason. Shoes are an integral part to running, you need different ones for different types of running/training. Also, your tastes change over time... and different types of shoes become your favourite. I have been slowly moving towards shoes with less heel drop, in an attempt to work on my running form (it generally emphasizes more midfoot strike). at least 50% Thomas's I swear! In Vancouver the last few weeks have been mostly nice weather, with the temperature in the morning and evening slowly getting a bit more bite. We have been making the best of it, trying to get out to places that might not be as easy in bad weather or would be under snow in the winter. Some of our running friends / acquaintances got together on the labour day weekend and ran the Howe Sound Crest trail. 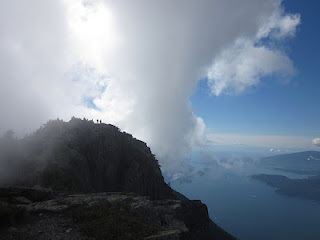 We started at Porteau cove, so climbed up to 1500m at the beginning (http://lh6.ggpht.com/_bVFXWzpMoyE/TFj958LKq8I/AAAAAAAACoI/1qFNC3KIVhU/P7240917.JPG), but after that it was up and down a beautiful hilly ridge (mostly in the sub-alpine, and rocky in places) back towards the Cypress bowl ski area. There was a bit of cloud hanging around the Lions (2 prominent rocky mountains along the ridge), but it was clear for views in most places.